An atmospheric river event is expected to plummet Southern California bringing heavy rain and snow into the area. Flash flood warnings have been issued in parts of Southern California, with potentially very dangerous debris flows expected as the strongest storm of the season descends upon the region. The heaviest rainfall is expected on March 21 and 22, 2018, according to the National Weather Service. Mandatory evacuations have been ordered in parts of Santa Barbara and Ventura Counties. The event is formed as a strong low-pressure system moves down from the Gulf of Alaska and taps into subtropical moisture from the south. 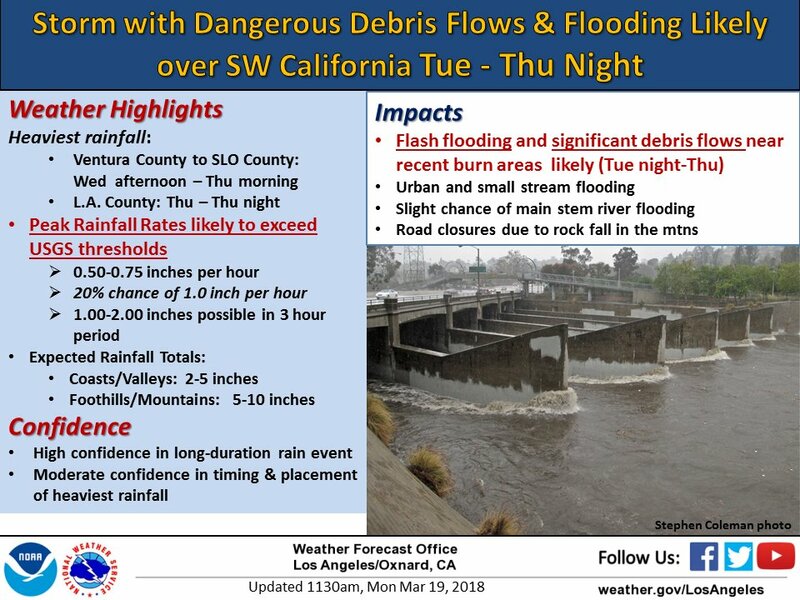 This will raise the risk of flooding and debris flows in Southern California while also spreading rain and heavy mountain snow across other parts of the West. Precipitation is expected to develop in much of California on Tuesday, March 20 and will spread into states of Oregon, Washington, Nevada and western Idaho by Wednesday, March 21. High snow levels are expected for Tuesday into Wednesday at highest elevations, generally above 1 800 meters (6 000 feet). Rainfall totals of 25 mm to 75 mm (1 to 3 inches) are expected for coastal and valley locations, with upwards of 75 mm to 150 mm (3 to 6 inches) for the foothill areas. Some areas may see as much as 200 mm (8 inches) of rain. 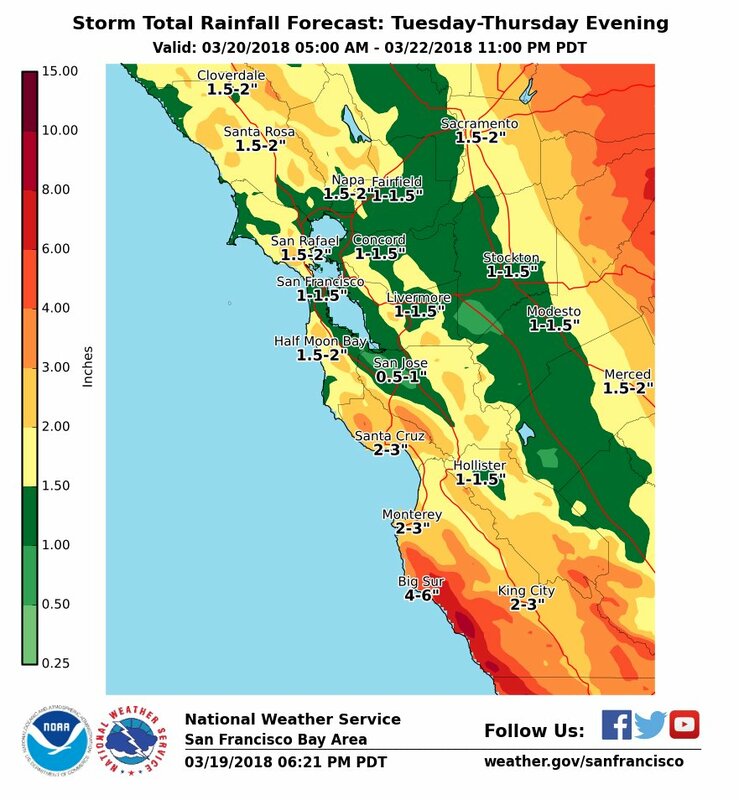 For the Los Angeles area, rainfall estimates for Tuesday, Wednesday and Thursday call for 25 mm to 100 mm (1 to 4 inches) of rain for coastal areas and 75 mm to 150 mm (3 to 6 inches) in the foothills and mountains. With moderate to heavy rainfall, it is possible that in some areas the rainfall rates may hit 25 mm (1 inch) per hour, and the storm could turn the recent wildfires scars into rivers of mud. 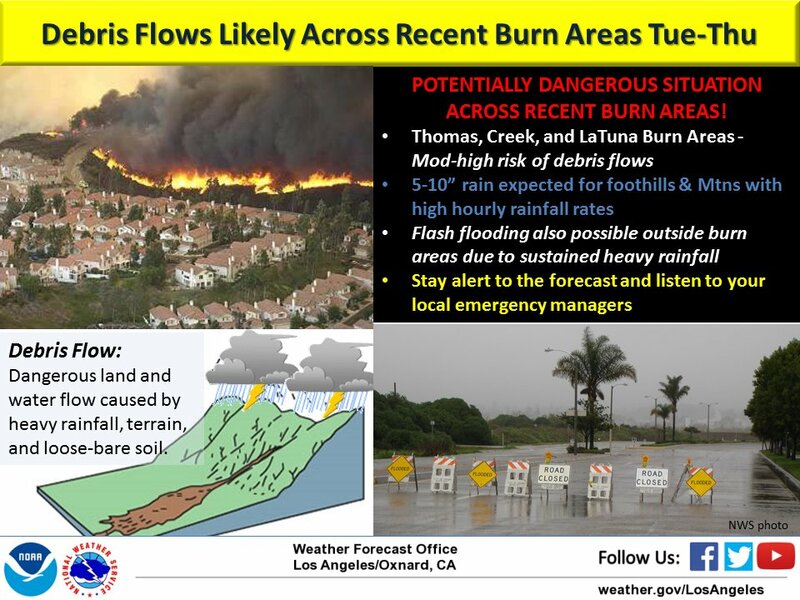 A major concern for burn areas in SW California is flash flood and debris flow potential Tuesday night through Thursday night. Flooding will also be possible outside burn areas. Mandatory evacuations were ordered by Santa Barbara and Ventura County officials for Tuesday at noon. Those in Extreme Risk and High Risk areas – red, yellow and grey areas on the Debris Flow Risk Map – near the Thomas, Sherpa and Whittier burn areas must be out of the evacuation areas by noon Tuesday. Those in the Alamo burn area were under recommended evacuations. 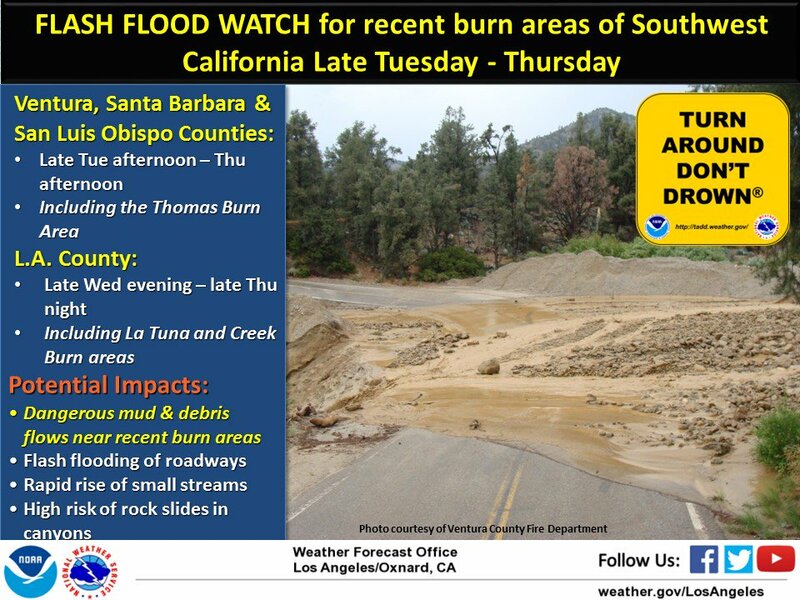 In Ventura, the risk areas include Matilija Canyon, North Fork, Vista Fire, Nye Road and La Conchita burn areas. Voluntary evacuations were also ordered in the county. An estimated 36 hours of precipitation could add up to some significant rainfall amounts, approaching 102 to 152 mm (4 to 6 inches) in the foothills and 51 - 102 mm (2 to 4 inches) for coastal areas. The most rain is expected in the San Gabriel Mountains, and in Ventura and Santa Barbara counties. The most critical period for wildfire burns areas is expected to be from early Wednesday into Wednesday night. According to Rob Lewin, director of the Santa Barbara County Office of Emergency Management, the amount of rain and the intensity will likely be enough to cause flooding even without the impact of the recent fires. "We could experience localized flooding and road closures, which are not isolated to the burn areas," Lewin said. "The threat of rock falls, mudslides and debris flow is high." "Individuals in the Alamo burn area are in a recommended evacuation warning area," according to a county spokesman. "People with access and functional needs in the extreme and high risk areas should consider immediate evacuation. Owners of large animals and livestock should consider relocating immediately." The evacuation orders were made in consultation with the National Weather Service, according to county officials. "Tuesday will start off uneventfully," National Weather Service officials said, describing a mostly cloudy start to the day. "But then, there will be a startling change in the weather." All of the radiation pollution in the Pacific Ocean is having a dramatic effect on weather patters in the western United States. Within five years, the western part of the United States will not be able to sustain life.